Version 2 of our Brew Revue is set for April 12th at The Onion Pub. Live music, craft beer, dancing, what’s not to like? If you were there for the last one you remember the band had everyone rocking until they kicked us out. It was a fantastic event so you will definitely want to be part of this one too. Tickets go fast so head to the website now to reserve your spots. We hope to see you there. We hope this letter finds all of you in good health and enjoying this winter season. The holidays have come and gone, and it is now time to focus on the potential of a new year, and the exciting advances we can make! The Jeffrey Pride Foundation For Pediatric Cancer Research had an incredibly successful year in fundraising this past year. Through our Warm Winter’s Night Dinner Dance, our golf outing, and many generous donations, we raised a record $500,000 in 2018, and have set a new goal going forward. On top of that we received an anonymous grant donation of $100,000! We are so thankful to the many people that have given so selflessly, and know that the kids benefiting from the research this money will fund, are forever grateful. We have made some changes to our corporate structure, adding two Directors At Large to our executive board. Tim Taylor and Bob Beaubien have joined the board, both coming from our Auxiliary Board, Tim serving as the Auxiliary Board’s Chair. Tim and Bob have been great additions and will bring new ideas to simulate growth and expand our community. We have also added some new members to our Auxiliary Board. Returning for another term are Tom Beath, Dave Nolan, Jim Murphy, Jim Daluga, Bill Jourdan, Todd Williams, Mark O’Hara, and the new Auxiliary Board Chair, Bob Quinn. Joining them are new members Anthony Crissie, Erin Yonkus, Karen Darch, John Kainz, Sean Lee, Dr. Dan Kuesis, and Cindy Kuesis. We look forward to letting them all go to work and know they will bring great enthusiasm and energy. We also will be assembling a “young Professionals” board in response to the many young people who have shown a great interest in helping cure childhood cancer. The five studies we have been funding are still going but are due to end at different times during 2019, allowing us to advance their findings or if necessary move in different research directions. At the conclusion of the studies we will be able to report more comprehensive updates/results. Of particular note, our study titled “Reducing Immediate and Long-Term Complications in Children with Downs Syndrome and Acute Leukemia” has been identified by The National Cancer Institute for further study. As we move forward with new donation money, we will be funding a study researching a type of leukemia called Childhood Hypodiploid Leukemia, and since our donation for this year was so substantial, the disease committees require a bit more time to decide because the size and scope can be so large. We will have more to report in the 2nd quarter. This is our 19th year as a foundation and we continue to grow, thanks to our dedicated community. Where most foundations like ours last only an average of 3 years, we couldn’t be happier with the impact we continue to make, and we couldn’t do it without your help, support, and trust. We commit to continue to make sound decisions as to where your donation dollars are spent, and rest assured that all the money goes directly to the research. With your continued support, we feel that we can find a cure in our lifetimes! Thank you for helping us reach our goal of cancer free lives for all kids! Check out our newest video premiered at the the Winter Gala in March. It was put together by Zach Dulla and focuses on a family that has benefited from your donations to research a cure for pediatric cancer. Warning, its very moving. Thank you for your continued generosity. Now in its 18th year, the all-volunteer Jeffrey Pride Foundation continues to battle the #1 disease killer of children in the U.S.-cancer. All money raised goes to the Children’s Oncology Group- the research group of doctors and scientists who oversee more than 90% of all pediatric cancer research in the U.S. and around the world. The grass roots research we fund is guided by the Chairman of COG, Dr. Peter Adamson, and has included several studies that have gone on to receive FDA approval including the most recent CART Therapy. This year’s gala, with over 400 in attendance, featured Dee Beaubien as Honorary Chair for the event, and the personal story of a gravely ill boy who was successfully treated by CART Therapy who has thus far gone on to live an active cancer-free life for nearly two years. We hope to share many more such stories in the future. By the end of 2018 The Jeffrey Pride Foundation will have raised and donated close to $3 Million since it’s inception in efforts to cure pediatric cancer. You can find us at http://www.jeffreypridefoundation.org/ to learn more, participate in our events or donate to the Foundation. Update you on our fund raising and events for 2017. Keep you apprised of future JPF events. Let you know how you can support us if you are an Amazon shopper. Share articles and videos on Pediatric Cancer research from recent publications. Tell you how JPF dollars are making advancements in research in our message from Foundation President Phil Fijal. Click here to access the web version of the e-mail. Please mark your calendar now to join your friends at the biennial Jeffrey Pride Foundation Winter Gala. It will once again be held at The Stonegate Banquet Centre in Hoffman Estates on March 10, 2018. 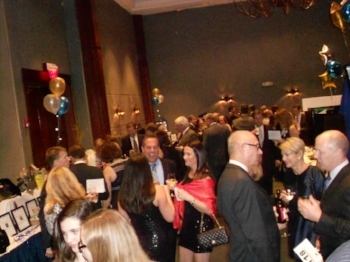 Year's past have shown the event to be an extremely fun evening for a great cause. We hope to see you there. Check back to the website in December for details on ticket purchase. July 21, 2017 will mark the 16th annual JPF Golf Outing again at Makray Memorial Golf Club. Over the years it has been both a really fun event and a mainstay in our fund raising efforts. Last year our friends helped us raise over $100,000 which was donated to the fight against Pediatric Cancer. In fact, over the years JPF has donated over $2,000,000 to support research for the cure. This year is our Honorary Chairman is Thomas MacCarthy, Chairman and CEO of Cornerstone National Bank and Trust. Tom has been a huge supporter of JPF and we are pleased to have him as this year's Honorary Chairman. We are both pleased and disappointed to announce the 2017 JPF Brew Revue has sold all of its available tickets. We had an upper limit from the Onion Pub and we hit that limit late in the evening on Feb 9th. There are however limited tickets available at the door. Obviously we are thrilled with the participation in a new event for us and thank you all to those who purchased tickets and made donations for this event. At the same time, we are disappointed that some of you who wanted to attend will not be able to. Based on the reception of this event we will continue to offer it in coming years so stay tuned for information on that. In the mean time, we can not express enough our sincere thanks for your support of the Jeffrey Pride Foundation. Start thinking about warmer weather and hold the date for our Annual Golf Outing on July 21st at Makray Memorial Golf Club. We are excited to announce the JPF Brew Revue event in Feb 2017 has finalized the artists playing at the Onion. All have donated their time and we are very appreciative of their support of our event. See the event page for details and to buy tickets online. Get ready for a fun evening. See you there!! We are excited to announce our first ever Music and Craft Beer Festival on February 11, 2017 at the Onion Pub in Lake Barrington. It will feature beer tastings from some of the best suburban area craft brewers along with appetizers. The evening will feature music by Gen XY and others. Mark your calendars. Ticket will be available for purchase online very soon. We are very excited to be adding this new event and hope you can make it. Watch your e-mail for more information.